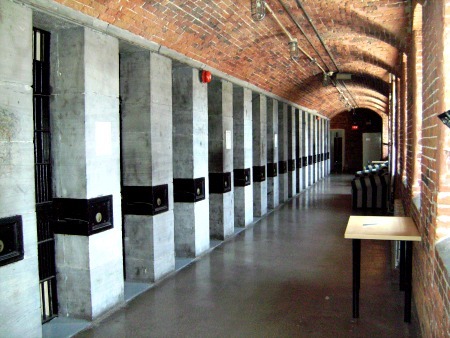 Is The Ottawa Jail Hostel Haunted? The building of Ottawa jail hostel started its life as the county prison. Designed by architect Henry Horsey the prison was built next to the courthouse and a tunnel was constructed to transport inmates to the courthouse without them having to go into a public area. The doors of the prison opened in 1862 and it was the main correctional facility for the area for over 100 years. On February 11th, 1869, it was the site for the execution of Patrick J. Whelan who assassinated Thomas D'arcy McGee. The hanging drew in a huge audience, with over 5000 people which was a massive turnout for the areas population at the time. The prison was not known for being a nice place to stay, but it was no different from other prisons at the time. It had rather basic and uncomfortable conditions for the inmates and of course deaths occurred, but no more than the typical prison of the day. There were only three hangings at the, with the last being in March of 1946, when Eugene Larment was executed for killing an Ottawa police officer. There a number of unmarked graves on the grounds of inmates who died within its wall's, these inmates would include everything from murders and the mentally ill, to just people locked up for being drunk and disorderly. Today the prison is open as a hostel for anyone looking for a cheap room to stay in, and its well known for being haunted. There have been many ghost hunting parties investigating this building, with it being widely agreed to be a top contender for the most haunted place in Canada. Personally i think the reason that this building has become so well known for its hauntings is due to its function. It plays on its haunted reputation and since people who stay in hostels are often traveling or generally younger folk, many camp fire type stories will be told and create and widely spread. However, i am by no means suggesting this place is not haunted, quite the opposite in fact. Generally a place wont get the reputation of being haunted for very long if it doesn't have any activity. This is one place were the stories seem to add up in terms of consistency, with a huge number of independent witness's making the same claims capturing the same evidence. The only "Known" ghost at the prison hostel is that of Patrick Whelan, who has been seen standing at the end of guests beds at night. They wake to see him standing there, staring down at them, only to fade away after a few seconds. The main hotspots of the prison are definitely the death row and the six solitary confinement cells. Orbs and strange mist like spirals have been captured on photos, but never visible with the naked eye. Apart from this the staff and many visitors have tales of everything from full apparitions walking down the corridors to being pushed by unseen hands.